The memorandum also includes technical appendices that contain detailed reports of the intersection capacity analyses. Figure 1 shows the study area, the five intersections that were analyzed, and the street network. 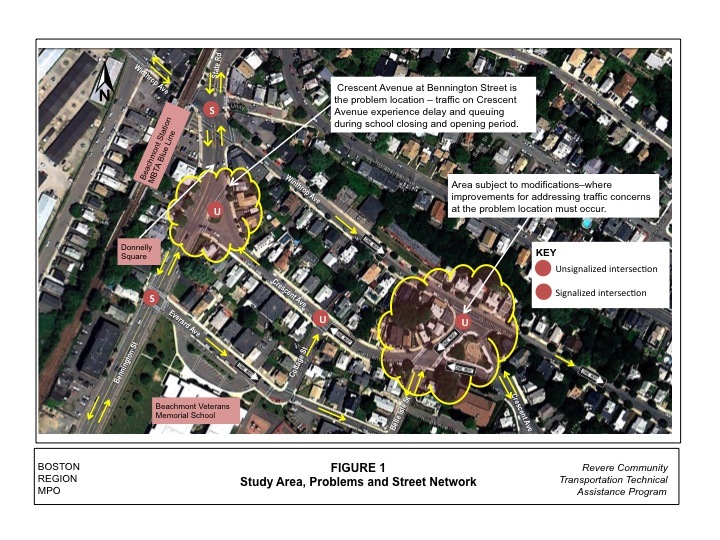 The intersection of Bennington Street and Crescent Avenue, located at Donnelly Square, is the problem location in this study. It is an unsignalized intersection under the jurisdiction of the Massachusetts Department of Transportation’s (MassDOT’s) Highway Division. Bennington Street is the major street; it is a two-way, four-lane street (two lanes in each direction) that runs in the north-south direction. Crescent Avenue is the minor street, it intersects Bennington Street at a T-intersection and its traffic is controlled by stop signs. Avenue) in the vicinity and they are in good condition. Crosswalks with wheelchair ramps have been constructed only on the approach of Crescent Avenue because of the T-intersection configuration and its close proximity to two closely spaced signalized intersections, one north and the other south of the intersection (Figure 1). During school opening and closing hours, a school crossing guard is posted at Donnelly Square to assist students. Long northbound queues from the intersection of Bennington Street, Winthrop Avenue, and State Road have been observed spilling over to this location, preventing Crescent Street traffic from exiting to Bennington Street. The intersection of Bennington Street and Winthrop Avenue and State Road is also located at Donnelly Square. It is a busy signalized intersection with high pedestrian-crossing activity because the MBTA’s Beachmont Station, on the Blue Line, is located in the southwest corner of the intersection. This intersection is congested during peak periods, with queues at all of the entry approaches. Winthrop Avenue is a one-lane, one-way street eastbound on the east side, and a two-lane, two-way street on the west side; State Road is a four-lane, two-way roadway. There are continuous sidewalks on each side of Bennington Street, Winthrop Avenue, and State Road in the vicinity, and they are in good condition. Crosswalks with wheelchair ramps have been constructed at the intersection and they are in fair to good condition. During school opening and closing hours, a school crossing guard is posted at the intersection to assist students. This intersection is heavily congested during the peak hours. Bennington Street and Everard Avenue is a signalized intersection located one block south of the problem intersection. It is under the jurisdiction of the MassDOT Highway Division. At the intersection, Everard Avenue is a one-way street heading eastbound and it serves drop-off and pickup traffic going to and from the Beachmont Veterans Memorial School and Seacoast High School, and provides access to the residences in the neighborhood. Everard Avenue can only be accessed from Bennington Street because of the one-way street system. During school opening and closing hours, school crossing guards are posted at this intersection to assist students and other pedestrians in crossing. This intersection is equipped with functioning pedestrian push buttons, well-marked crosswalks, continuous sidewalks, and wheelchair ramps, all of which are in good condition. Crescent Avenue and Cottage Street is an unsignalized intersection, located east of the problem intersection. Everard Avenue leads to Cottage Street, another one-way street northbound, which takes traffic to Crescent Avenue to head westbound to Bennington Street. At the intersection, Cottage Street is controlled by stop signs, while traffic on Crescent Avenue does not stop. Both streets have sidewalks on both sides; the sidewalks on Crescent Avenue are in good condition, but those on Cottage Street need improvements. Crosswalks have being installed for crossing both street and they have wheelchair ramps. 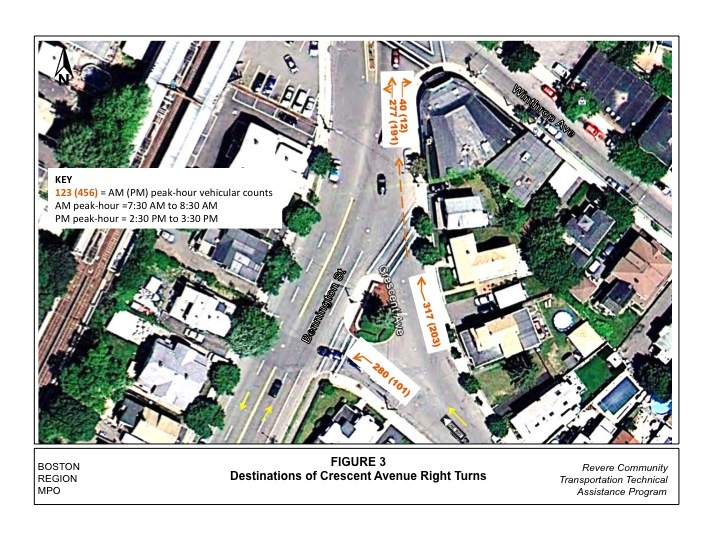 The intersection of Winthrop Avenue and Crescent Avenue is the location recommended by Revere officials to be studied for modifications in order to address the traffic problem on Crescent Avenue at Donnelly Square. It is a complicated intersection, under the jurisdiction of the City of Revere. At this intersection, Winthrop Avenue is a one-way street eastbound; because it is the major street, its traffic does not stop at this intersection. Crescent Avenue is the minor street, and its traffic is controlled by stop signs. There are continuous sidewalks on both sides of Winthrop Avenue and Crescent Avenue at the intersection and they are generally in good condition. Crosswalks have been provided for crossing Crescent Avenue, but there are none for crossing Winthrop Avenue at the intersection. Staff met with the Revere traffic engineer to discuss the traffic concerns. The main concern is traffic delay and queuing on Crescent Avenue at Bennington Street. Figure 1 shows the problem location and the area subject to modification. Due to the one-way restrictions in the vicinity, vehicles exiting the schools from Everard Avenue are forced to make a series of left turns that in the end place them heading west on Crescent Avenue toward Bennington Street. During the school opening and closing periods, this situation causes a significant traffic back-up on Crescent Avenue, which has become a problem. In addition, Bennington Street northbound traffic waiting for the green light at Winthrop Avenue often backs up into the problem location and blocks vehicles from exiting Crescent Avenue, causing long delays and queues on Crescent Avenue, especially during the schools’ PM peak period. This situation also forces Crescent Avenue motorists to make unsafe maneuvers. Staff collected crash data for the most recent three years available from the MassDOT Registry of Motor Vehicles Division, from January 2006 to December 2009. The crash data indicated that apart from the signalized intersection of Bennington Street, Winthrop Avenue, and State Road, none of the study intersections had a safety problem, as indicated by the very low number of crashes at each of the intersections. At the Bennington Street, Winthrop Avenue, and State Road intersection, there were 25 crashes during the four-year period. They resulted in one fatal injury, five non-fatal injuries, and 12 property-damage-only collisions; the severity of seven of the crashes was not reported. Six of the crashes were angle-type crashes, two were rear-end crashes, five were sideswipe crashes, and nine were single-vehicle crashes; the category of the collision of three of the crashes was not reported. Using the PM peak-hour traffic volumes at the intersection, the crash rate was calculated as 0.85 crashes per million entering vehicles (MEV), which exceeds the Highway Division’s District 4 average crash rate of 0.78 MEV. At the Bennington Street and Crescent Avenue intersection, there were three crashes during the four-year period. They resulted in one injury and two property-damage-only collisions. Two of the crashes were angle collisions. None of the three crashes involved pedestrians or cyclists. At the Bennington Street and Everard Avenue intersection, there were two crashes during the same period; one resulted in injuries and the other in property-damage-only. There were no crashes reported for the Winthrop Avenue and Crescent Avenue intersection. There were no crashes reported for the Crescent Avenue and Cottage Street intersection. MPO staff collected turning-movement counts at two intersections in the study area on March 20 and 21, 2012; they were the Bennington Street and Crescent Avenue intersection and the Winthrop Avenue and Crescent Avenue intersection. The data were recorded in 15-minute intervals for the school opening and closing periods: 7:00 AM to 9:00 AM and 2:00 PM to 4:00 PM. The peak-hour (within each of the school’s two-hour peak periods) turning-movement volumes and pedestrian crossings for the schools are shown in Figure 2. The turning-movement counts for the intersections of Crescent Avenue at Cottage Street and of Bennington Street at Everard Avenue were calculated from the manual counts. The turning-movement counts at the intersection of Bennington Street, State Road, and Winthrop Avenue were estimated from a previous count by using growth factors based on recent counts on Bennington Street. The following is a brief description of the destinations of traffic on Crescent Avenue. At Donnelly Square, about 600 vehicles use Crescent Avenue during the AM peak hour (Figure 3); about one-half of that traffic turns left and heads southbound on Bennington Street and the other half turns right and heads northbound on Bennington Street. For the right turns onto Bennington Street northbound, the majority (87%) continues on Bennington Street to State Road or turns left at the traffic signal and heads westbound on Winthrop Avenue. A very small proportion of the traffic on Crescent Avenue (13%) heads eastbound on Winthrop Avenue. During the PM peak hour, the volume of traffic on Crescent Avenue drops to around 320 vehicles. About 30% of that traffic turns left and heads southbound on Bennington Street; the remaining 70 turns right and heads northbound on Bennington Street. For the right turns onto Bennington Street northbound, the majority (94%) continues on Bennington Street to State Road or turns left at the traffic signal and heads westbound on Winthrop Avenue. Very small proportion of the traffic on Crescent Avenue (6%) heads eastbound on Winthrop Avenue. This traffic pattern is not surprising because most of the City of Revere is situated north and west of the Beachmont Veterans Memorial School and Seacoast High School. This means that the overwhelming majority of the students do not live in the immediate neighborhood of the school. There were moderate to high pedestrian activities at all of the intersections. The majority of these pedestrians were students and parents of students of the two schools. All of the crossings in the Bennington Street corridors had school crossing guards. 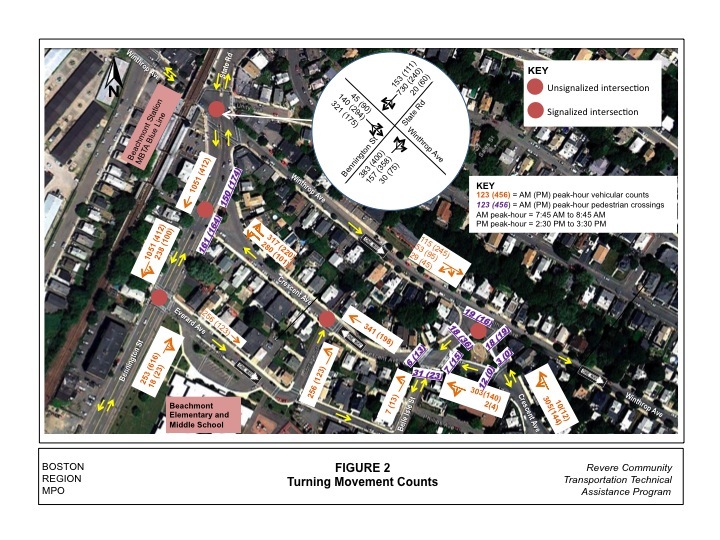 Based on the turning-movement counts, lane configurations, and signal timing and phasing information (obtained from the MassDOT Highway Division), intersection capacity analyses were conducted for all five intersections by using an intersection capacity analysis program, Synchro. 1 Tables 1 and 2 show the AM and PM peak-hour analyses for the schools, respectively, for the existing conditions and with improvements. The AM and PM existing conditions analysis indicate that the traffic on Crescent Avenue experiences delay and queuing entering Bennington Street. The queue on Crescent Avenue westbound sometimes extends beyond Cottage Street, causing delays for the school drop-off and pickup traffic. As a short-term measure to address the problems, MPO staff examined the possibility of modifying the roadways in the area to reduce the volume of traffic on Crescent Avenue that heads westbound to Donnelly Square. The objective is to reduce delay and queuing on Crescent Avenue, during the school opening and closing periods. The target traffic in this short-term option is a portion of the right turns from Crescent Avenue at Donnelly Square with destinations east of the Winthrop Avenue and Crescent Avenue intersection, as they can easily be rerouted through this intersection via Belle Isle Street (Figure 4). Turn the portion of Crescent Avenue at Winthrop Avenue west of the square into a two‑way street by striping and installing stop signs. Allow school drop-off and pickup traffic with destinations east of the Crescent Avenue and Winthrop Avenue intersection to use Belle Isle Street and Crescent Avenue to connect to Winthrop Avenue to head eastbound to their destinations. Retime the traffic light at the Bennington Street and Winthrop Avenue intersection to give more green time to the northbound approach during the school closing period, from 2:00 PM to 4:00 PM, to prevent Bennington Street northbound queue from blocking traffic on Crescent Avenue at Bennington Street. At the intersection of Bennington Street at Crescent Avenue, install “Do Not Block the Intersection” signs and markings. Instead of a crossing guard at Bennington Street and Crescent Avenue, use the services of a police officer, who would direct traffic at the intersection with the aim of creating gaps in the Bennington Street traffic for Crescent Avenue traffic to exit. An estimate of the construction costs of the short-term improvements is approximately $1,000 to $5,000. The AM and PM peak-hour levels of service, delays, and queues that would result from the short-term improvements are shown in Tables 1 and 2, respectively. The analysis indicates that the short-term option would not cause any delay or queuing problems at the area subject to modification. It would also not reduce delays and queuing on Crescent Avenue near Donnelly Square. The primary reason behind the modest benefits from the short-term improvements is that the majority (87%) of the traffic turning right from Crescent Avenue onto Bennington Street stays on Bennington Street to travel to State Road or continues to the signal at Winthrop Avenue and turns left to head westbound on Winthrop Avenue. Only about 13% of the right-turning traffic at Crescent Avenue near Donnelly Square has destinations east of the Winthrop Avenue and Crescent Avenue intersection. In summary, the short-term option has a low cost but does not really fix the problems. Because the benefits from the short-term improvements were modest, MPO staff developed three long-term improvements. 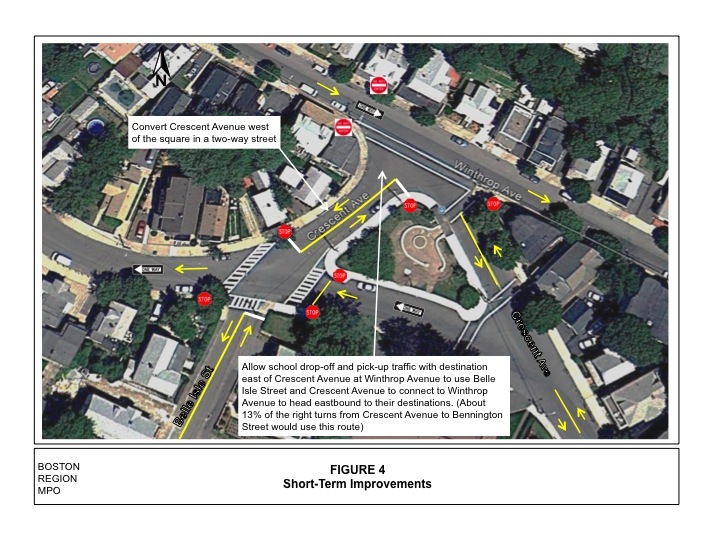 The long-term improvements should provide the most benefits for alleviating traffic delay and queuing on Crescent Avenue at Donnelly Square, but they may be unpopular and expensive. Nonetheless, staff wanted to present them for discussion and long-term planning purposes. Option 1 has the potential to reroute the majority of the right-turning traffic on Crescent Avenue heading northbound to State Road or westbound on Winthrop Avenue. This traffic would be routed through a proposed two-way, two-lane Winthrop Avenue via Belle Isle Street (Figure 5). Convert the section of Winthrop Avenue between Bennington Street and Crescent Avenue into a two-way, two-lane street. Remove parking from one side of Winthrop Avenue between Bennington Street and Crescent Avenue in order to create a travel lane in the westbound direction. Make geometric modifications at the intersection of Bennington Street, Winthrop Avenue, and State Road to accommodate the proposed westbound Winthrop Avenue traffic. Make geometric modifications and install signs to prohibit left turns from the westbound approach of Winthrop Avenue at the Bennington Street signal. Left turns would be maintained at Crescent Avenue at Bennington Street to accommodate this traffic. Install signal posts and heads for the new westbound Winthrop Avenue traffic at the signal at Bennington Street and State Road. Upgrade the traffic signal at the intersection of Bennington Street, State Road, and Winthrop Avenue to make it accessible and to include the new westbound phase and intervals. Install signs for directing traffic to Winthrop Avenue and for controlling traffic. Close the northern portal of Crescent Avenue, which is currently used as a free right-turn lane onto Bennington Street. The southern portal (where vehicles currently turn left onto Bennington Street) is wide enough to also accommodate a right-turn lane. Eliminating the northern portal would reduce the crossing distance for pedestrians and allow for more queue storage on Bennington Street approaching the Winthrop Avenue intersection. Reduce delay and queuing on Crescent Avenue near Donnelly Square. Not cause delay or queuing problems at the intersection of Winthrop Avenue and Crescent Avenue. Not increase delay at the signalized intersection of Bennington Street, State Road, and Winthrop Avenue. Change the current traffic circulation pattern. Require parking to be eliminated on at least one side of Winthrop Avenue between Bennington Street and Crescent Avenue in order to create a westbound travel lane. Be expensive, need community participation, require engineering and design by the City, require MassDOT Project Review Committee approval, and require funding programming, likely through the Boston Region MPO. The objective of Option 2 is to provide some positive right-of-way assignment (green time) for traffic on Crescent Avenue entering Bennington Street without altering the existing traffic circulation pattern. The intersection meets Warrant 2 (Four-Hour Volume) and Warrant 3 (Peak-Hour) of the Manual on Uniform Traffic Control Devices (MUTCD). 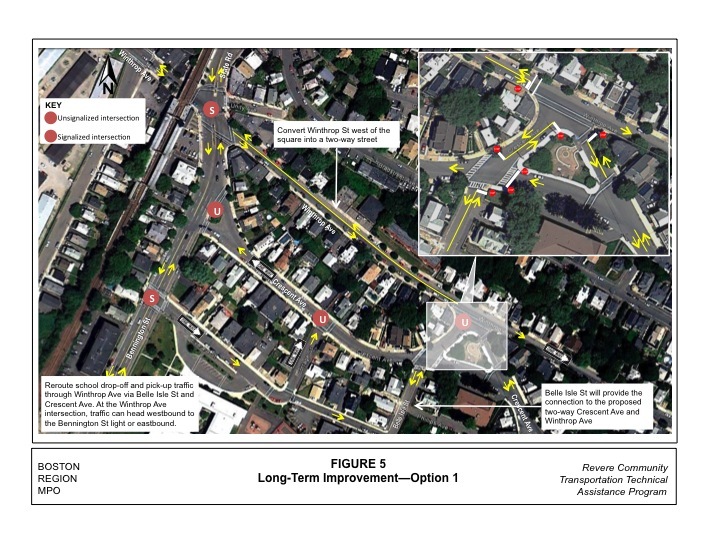 2 Option 2 would result in three closely-spaced traffic signals on Bennington Street, located at its intersections with Everard Avenue, Crescent Avenue, and Winthrop Avenue (Figure 6). Install an accessible traffic signal at the intersection of Bennington Street and Crescent Avenue. Make geometric modifications at the Bennington Street and Crescent Avenue intersection to accommodate the traffic signal. Provide signal coordination for the closely-spaced traffic signals on Bennington Street. Reduce delay queuing on Crescent Avenue near Donnelly Square. Not alter the existing traffic circulation pattern. 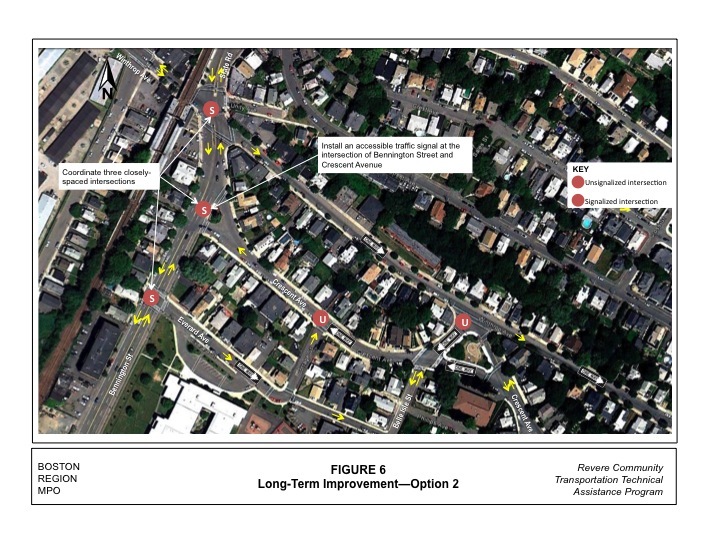 Not increase delay significantly at the signalized intersection of Bennington Street, State Road, and Winthrop Avenue. It could be very expensive, need community participation, require engineering and design, and possibly require programming and funding through the Boston Region MPO. The traffic queue and lack of storage on Bennington Street, due to the closely-spaced signals, could possibly lead to blocking traffic on Crescent Avenue. Option 3 is an enhanced version of Option 1. The objective of Option 3 is to increase capacity at the intersection of Bennington Street, State Road, and Winthrop Avenue. Reducing congestion at this intersection would prevent queues on Bennington Street from spilling into the intersection with Crescent Avenue and blocking Crescent Avenue traffic from entering Bennington Street. Option 3 includes all of the improvements in Option 1 and also moving the existing bus stop further west on Winthrop Avenue, striping an exclusive right-turn lane on the eastbound approach of Winthrop Avenue, upgrading the signal to make it accessible, and retiming the traffic signal. These improvements would provide the needed capacity for addressing congestion at this critical intersection in the study area. There may be other ways to improve the processing of traffic through this intersection and reduce queues that were not tested as part of this analysis. This is because the primary focus of this study was to find solutions for the congestion at Bennington Street and Crescent Avenue. However, the conditions at that location cannot actually improve unless the level of service, delays, and queues improve at the intersection of Bennington Street, State Road, and Winthrop Avenue. A two-lane approach at Winthrop Avenue eastbound combined with signal retiming is one way to improve this location. Other options may exist; they should be explored as part of a design study for this intersection. Reduce delay at the Bennington Street, State Road, and Winthrop Avenue intersection and prevent traffic queues from blocking Crescent Avenue at Bennington Street. Is as expensive as Option 1, needs community participation, requires engineering and design, and possibly requires programming and funding through the Boston Region MPO. Would require relocating the existing bus stop on the eastbound approach of Winthrop Avenue. The above safety and operations analyses indicate that changing the circulation pattern in the vicinity of the school as part of the short-term option would not reduce delays and queues on Crescent Avenue near Donnelly Square, because the traffic pattern indicates that the majority of the traffic on Crescent Avenue at Donnelly Square has destinations west, north, or south (in the AM peak hour) of the Square. However, having a qualified police officer manage traffic at the intersection of Bennington Street and Crescent Avenue during school opening and closing times, in conjunction with signs and markings for “Do Not Block the Intersection,” could be an effective measure to take. The police officer would act as a “traffic signal” with the goal of creating gaps of sufficient length in the Bennington Street traffic to allow Crescent Avenue traffic to turn left or right. All long-term options would reduce delays and queues on Crescent Avenue near Donnelly Square by varying degrees. Option 1 would reduce traffic and delay on Crescent Avenue largely by changing the existing traffic circulation pattern. Option 2 would not change the existing traffic circulation pattern but would create three closely-spaced signals (200 feet apart) that would possibly cause queues that would block traffic on Crescent Avenue. Option 3 would reduce traffic delay and queues on Crescent Avenue and Bennington Street and would require relocating the bus stop on the eastbound approach of Winthrop Avenue farther west. The common factor in all three long-term options is the existing level of service, queues, and delays at the Bennington Street, State Road, and Winthrop Avenue intersection. Specifically, the northbound Bennington Street approach backs up and impedes the Crescent Avenue traffic from entering Bennington Street. This is the key intersection that the City must focus their efforts on before embarking on other traffic improvements in this part of Revere. Improvements at the intersection of Bennington Street and Crescent Avenue could be considered in conjunction of the design of the critical intersection addressed above. 1 Synchro Version 7 was used for these analyses. This software is developed and distributed by Trafficware Ltd. It can perform capacity analysis and traffic simulation (when combined with SimTraffic) for an individual intersection or a series of intersections. 2 U.S. Department of Transportation, Federal Highway Administration, Manual on Uniform Traffic Control Devices for State Streets and Highways, 2009 Edition. 1 Delay in seconds per vehicle. 2 95th percentile queue in feet; # means that the 95th percentile volume exceeds capacity. Note: Shading denotes street approaches with delay and queuing problems. 2 95th percentile queue in feet’ # means that the 95th percentile volume exceeds capacity.